American astronauts are drawn by a mysterious force to the planet Venus, which they find to be inhabited only by beautiful women and their despotic queen. Five astronauts successfully fly to Mars where they encounter seemingly friendly and advanced inhabitants who harbor covert plans to use their ship to invade Earth. The Office of Scientific Investigation sends A-Men agents to investigate reports of unusual magnetic activity in various communities. Capt. Neal Patterson: We may not have a chance to talk later. We may not even live through the day. But, I just want to say, while I have the chance: I love you. Talleah: Loff - I've almost forgotten. But, if it is the varm feeling dat makes my heart sing, ten I too loff you. Q: So if it's the future, how come the earthmen don't have ray guns like the Venusians? Q: Did Ben Hecht really write this? Q: How is justice administered in Venusian society? 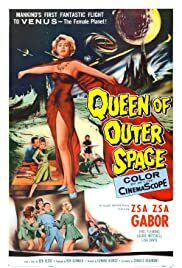 Steve Rhodes (newsgroup review) sums it up best when he says, "'Queen of Outer Space' is a parody of science fiction films. Whether it meant to be so at the time is another question." This is prime material for MST3K (very similar to "Fire Maidens from Outer Space"), but they might be avoiding "Queen" because it almost makes fun of itself. It reeks of cardboard sets, silly dialogue, and more phallic symbols, hot babes, and sexual innuendo than you can wave a stick (or laser gun) at. The astronauts ride in Lay-Z-Boy chairs and Zsa Zsa Gabor is a real treat. Never taking itself seriously, it's the "Austin Powers" of the sci-fi genre.